About Southwark Metal Manufacturing Co. - Southwark Metal Mfg. Co.
About Southwark Metal Manufacturing Co. 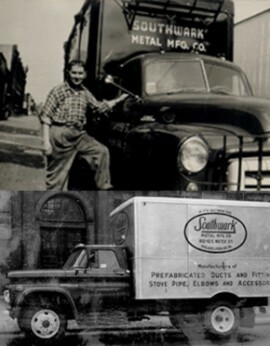 Since 1946, Southwark Metal Manufacturing Company has been a family owned, private company specializing in providing high quality sheet metal pipe, duct, and fittings for residential HVAC systems. Third generation ownership and a highly dedicated management staff are committed to the company legacy of workmanship, personalized service, and customer partnership. We believe strongly that our success, and all our future successes, are built on the strong relationships with our customers. Whether you are a large distributor or small family business, whether you have been our partner for decades or we are a new vendor for your business, Southwark Metal is dedicated to earning your business every day and helping you meet and exceed all your goals. Southwark Metal currently has six facilities across the United States to better serve our distributors. With our regional manufacturing staff and customer service representatives, you can be assured that quality products and support are never far away. Each plant maintains a weekly delivery schedule for your convenience and efficient fulfillment of all orders. Our friendly Southwark Metal representatives are aware of your needs at a local level and can speak directly to the challenges and opportunities of your region. Currently, Southwark Metal services distributors in 48 states across the nation; no matter where you are, we are ready to assist you with your HVAC needs. Southwark Metal has been an important part of the HVAC industry as a trusted member and premier vendor for decades. As a partner and frequent top vendor of various cooperatives, buying groups, national accounts, and large and small distributors alike, we are proud to participate in leading the industry forward.